For today's #SpeakUp post, the lovely Charlotte is going to be talking about a topic that I think a lot of young people struggle with, but we don't talk about a lot. That topic is; living for yourself. It's so easy to get caught up in routine, living your daily life almost like a robot without actually taking, time to think about what were doing, we just do everything automatically. It's so easy to obey the rules and instructions of someone else, without actually taking time out for yourself. Reading Charlotte's post made me realise how little time I dedicate to myself for chill time or doing something that isn't work related. If I am not doing college work of some form, I am blogging. If I am not doing one of those two things I am probably doing some chores for my parents. The hours in the day fly by and I realise I haven't actually stopped all day. Charlotte has inspired me to make a bucket list and try and dedicate some time at least once a month (I'm no way near as ambitious as Charlotte) to doing something that I want to, which is for myself. I hope this post helps inspire you too and we can all start living for yourselves a little bit more! Hi! I’m Charlotte from VieAvecCharlotte! 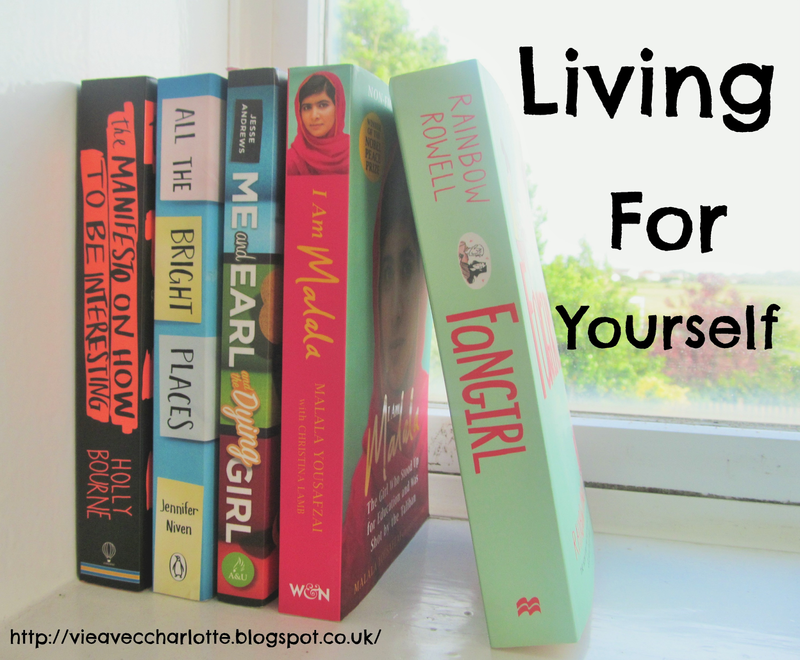 I’m so excited to be writing this #SpeakUp post about living for yourself for Nicole! This topic is something I am struggling with at the moment and I thought I’d write this post for #SpeakUp to maybe help anyone else who may be feeling similar to me. To begin with, I thought I’d tell you all a little thing about me and this topic. I realised that I haven’t been living my life for me at all recently. It is just that I do all these things and tasks and jobs for other people and I never leave any time for me. I get up at a time that has to suit a schedule that someone else makes me do, go to a place where I have to learn things that someone else thinks are important as well as stick to rules and regulations that someone thinks I should follow. Then I come home and I talk to my school friend about her problems *which I don’t mind doing btw*, then I do homework, then I sleep. And in the time I do have for myself, I’m so tired that I just lounge about on the internet. I noticed this the other day when I was reading through my bucket list and only 2 things out of the 7 pages *yes. Seven. I’m a very ambitious person* had been ticked off and that’s not how my life should be. When I realised this, I started to feel really down and as though I was stupid because I was wasting time I have. Also that I was wasting the time I have a teenager. I’m going to try and live for me because I grasped the idea that I’m important too. I forgot that for a while, but now its back and I wanted to share it all with you. I’m going to scrapbook again. I started one a few months back and I want to finish it. I’m going to write a bullet journal. I have started one and I know that lots of people do one for the week/year etc. But mine is sort of one for ‘life’. So far, I have written a page on all the books I want to read and all the films I want to watch. This way, I’m going to make sure I do everything I want to do. I’m going to stop worrying about what other people think. Now, to counter this, I did write a post on my blog, A Letter To My Headteacher, in which it is clear that I do care about what people think, but I’m going to try and stop now. If I want to do something, then I will and I won’t not do it because someone thinks it's stupid. I’m going to see my friends more often. I love my friends so much and I realised that I hardly ever see them outside of school. But seen as the summer holidays are coming up, I’m going to really try and see them more. I’m going to stop letting people boss me around. If you know me, and I mean actually know me, then you’ll know that I do not let people do this that much but then again, I do. I do it a lot, and I don’t like that, so I’m not going to do it that much anymore. I’m going to make sure I allocate time for myself every week – maybe even every day eventually! – maybe to just write in my bullet journal, stick down some photos in my scrapbook or watch a film! Just doing a little, tiny thing like that would maybe make my day a little brighter. Also, I’m going to try and tick off one thing on my bucket list every fortnight – or month – this a really nice idea that Nicole actually gave me, so I’m going to give it a go. Although, I’m not sure how easy it’ll be for a 14-year-old girl who still checks behind the bathroom door for axe-murders every time she goes in *don’t judge me* to ‘set foot on every country on the planet’ or ‘get on a train and get off at a random stop to explore’ would be… Maybe ‘taking everyone in a nursing home a flower’, ‘going to a pet shop, buying birdseed then asking how long it’ll take for the birds to grow’ or ‘finish an entire bottle of nail polish’, is more likely at this current moment in time, but a girl’s gotta dream! What do you plan on getting out of this? If you only take one thing from this, please can it be this? Because even though I don’t really know any of you, making sure that you all remember that and tell yourself that, that’s important for me. And I’m sure that everyone else around you wants you to remember it too. Well, I think that’s it for me! If you’d like to get to know me a bit better, then you can visit and have a per-ruse of my blog here. Also, you can visit my Twitter Account here, as well as my Instagram profile here! Thank you so much to Nicole for letting me write a post for her amazing campaign and blog! And if you’re one of my readers, please give Nicole a follow! You definitely won’t regret it! Are you good at living for yourself? If, so what do you do to make sure you take time out for yourself? Do you have a bucket list? I would love to know in the comments below! Thank you so much for letting me write for #SpeakUp Nicole! I really enjoyed it! Socks and sandals!?! What were my parents thinking!?! Also, congratulations on 100k page views!! I'm so proud of you lovely! This is such a great post! Making time for myself is definitely something I have struggled with, and this has strengthened my resolve to give more time to my hobbies and be more adventurous!